329 Commonwealth is located on the north side of Commonwealth, between Hereford and Massachusetts Avenue, with 327 Commonwealth to the east and 333 Commonwealth to the west. 329 Commonwealth was designed by architect Obed F. Smith and built in 1895-1896 by Warren D. Vinal, mason, as the home of George Wheatland, Jr., and his wife, Florence Saumarez (Dumaresq) Wheatland. They previously had lived at 235 Commonwealth. 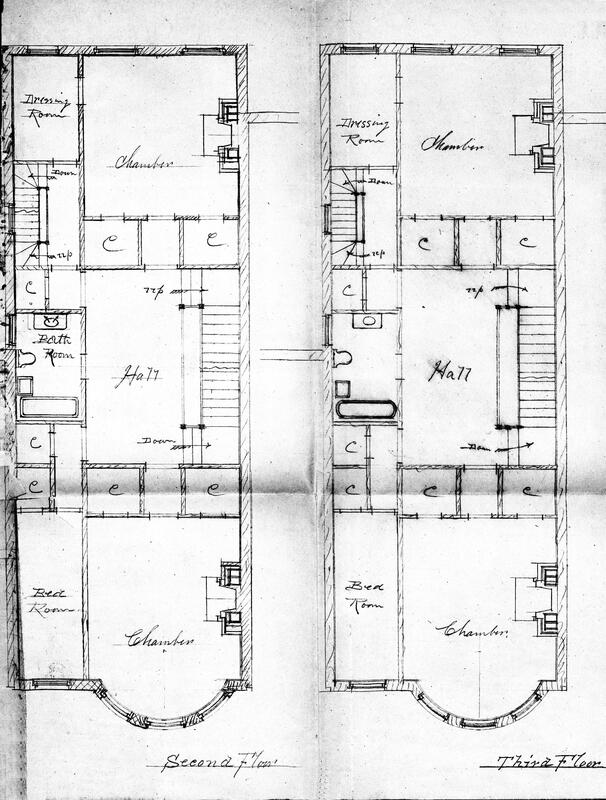 He is shown as the owner of 329 Commonwealth on the original building permit application, dated November 29, 1895, and on the final building inspection report, dated December 15, 1896. George Wheatland was a building contractor and real estate developer. Bainbridge Bunting’s Houses of Boston’s Back Bay credits him with building more than 140 houses in the Back Bay and Bay State Road neighborhoods between 1867 and 1907. George Wheatland purchased the land for 329 Commonwealth on November 26, 1895, from Eleanor (Pearson) Claflin Mack, the wife of wholesale dry goods merchant Thomas Mack. The Macks lived at 269 Commonwealth. Eleanor Mack had purchased the lot on January 2, 1880, from Fanny Pope (Hovey) Morse, the wife of attorney John Torrey Morse, Jr. The Morses lived at 9 Fairfield. It was the western half of a lot Fanny Morse had acquired on February 20, 1879, from a real estate investment trust formed by Grenville Temple Winthrop Braman, Henry Dwight Hyde, and Frank William Andrews, part of one of four tracts of land they had purchased on March 1, 1872, from the Boston Water Power Company. 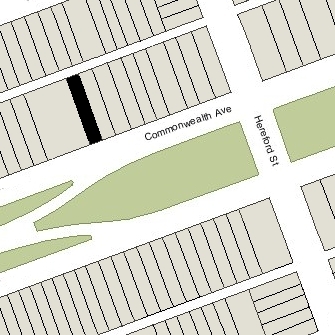 Click here for an index to the deeds for 329 Commonwealth, and click here for further information on the land on the north side of Commonwealth between Hereford and Massachusetts Avenue. By the 1889-1900 winter season, the Wheatlands were joined at 329 Commonwealth by their son-in-law and daughter, Jacob Crowninshield Rogers Peabody and Florence (Wheatland) Peabody. He had recently returned from serving as an officer in the 6th Massachusetts Volunteer Regiment, which fought in Puerto Rico and Cuba during the Spanish-American War. The Peabodys also maintained a home in Danvers. The Wheatlands and the Peabodys continued to live at 329 Commonwealth during the 1903-1904 winter season but moved thereafter. At the time of the 1910 US Census, George and Florence Wheatland were living at the Hotel Victoria at 273 Dartmouth and Jacob and Florence Peabody were living in Groton. On April 16, 1904, 329 Commonwealth was purchased from George Wheatland by Margaret (Darlington) Bennett, the wife of stockbroker Stephen Howe Bennett. They previously had lived at 486 Beacon. Margaret Bennett died in April of 1915. 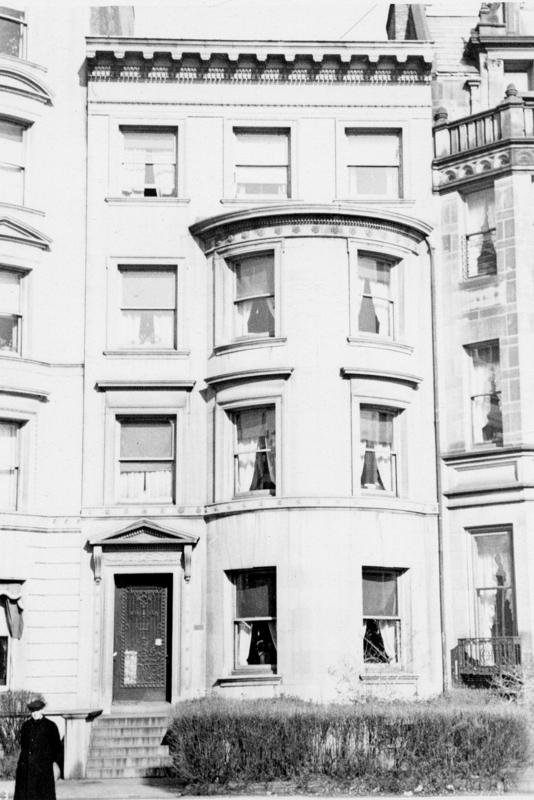 Stephen Bennett continued to live at 329 Commonwealth with their three unmarried daughters: Elizabeth Bennett, Margaret Darlington Bennett, and Helen Howe Bennett. Margaret Bennett married in August of 1917 to Thomas Edmund Cottman. After their marriage, they lived in Green Spring Valley, Maryland. Elizabeth Bennett married in October of 1919 to Edward Cunningham, Jr. After their marriage, they lived at an apartment at 261 Beacon and then, during the 1920-1921 winter season, at 329 Commonwealth with her father and sister, Helen. In 1921, Stephen Bennett moved to 527 Beacon, the Cunninghams moved to Westwood, and Helen Bennett moved to Maryland where she married in June of 1923 to Bulkeley Livermore Wells. During the 1921-1922 winter season, 329 Commonwealth was the home of Mr. and Mrs. H. L. Burge. In 1923, 329 Commonwealth was the home of Frederick Page Royce and his wife, Kate Eva (Ames) Royce. He was vice president of the Stone and Webster engineering firm. Their usual residence was their home, Pine Knoll, in Dedham. They probably leased 329 Commonwealth for part of the year because their daughter, Harriet, was a debutante during the 1922-1923 winter season (the house was not listed, however, in the 1923 Blue Book and the Royces and Miss Royce were listed in Dedham). On June 1, 1923, 329 Beacon was purchased from the Bennett family by Robert F. Wilkins, an insurance broker. He and his wife, Florence (Dillon) Wilkins, lived in Dorchester. On November 9, 1923, 329 Commonwealth was purchased from Robert Wilkins by Miss Ellen J. Meagher. She previously had been a lodger at 281 Dartmouth. She continued to live at 329 Commonwealth until about 1933. 329 Commonwealth was not listed in the 1934-1937 Blue Books, and was shown as vacant in the 1934-1937 City Directories. In 1926, Ellen Meagher had entered into a mortgage with the New England Trust Company. On November 7, 1934, it transferred the property to Walter A. Kennedy, who foreclosed on the mortgage and transferred it to Clarence A. Roberts on December 15, 1934. On July 23, 1935, Clarence Roberts transferred the property to the New England Trust Company, who then held the property in a trust. In June of 1937, New England Trust filed for (and subsequently received) permission to convert the property from a single-family dwelling into a lodging house. By 1938, 329 Commonwealth was the home of Roy Wilbur Hunt and his wife, Lillian E. (Fookes) Hunt, who probably were the operators of the lodging house. They previously had lived at 338 Commonwealth. They continued to live at 329 Commonwealth until about 1940. By 1941, 329 Commonwealth was the home of Mrs. Mary Edith (Todd) Bush, the widow of James William Bush (who had been a chiropractor and a minister of the gospel), who operated it as a lodging house. She previously had lived at 155 Massachusetts Avenue. On February 16, 1944, Mary Bush acquired 329 Commonwealth from the New England Trust Company. She continued to live there until about 1958. On August 19, 1959, Garland Junior College acquired 329 Commonwealth from Mary Bush. In September of 1960, the college filed for (and subsequently received) permission to convert the property from a lodging house into a girls dormitory. 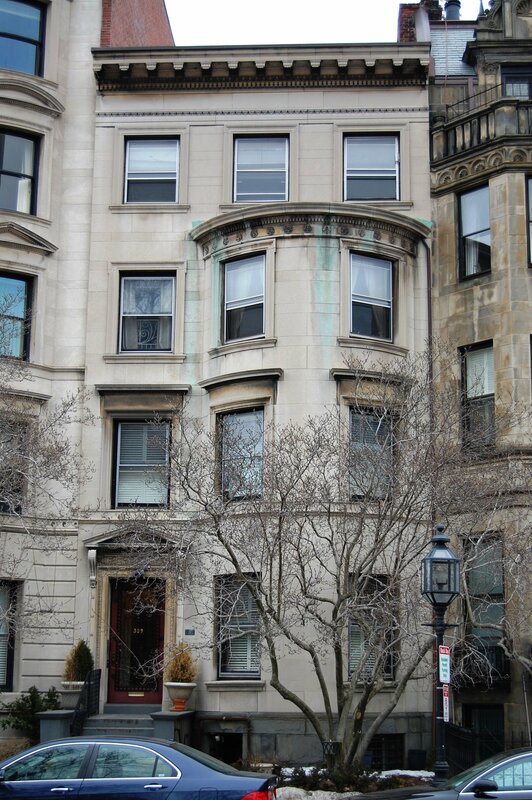 The College had acquired 337, 339, 341, 343 Commonwealth in the 1930s, and by the late 1960s had assembled a portfolio of 22 properties in the western portion of the Back Bay: 315, 319, 321, 329, 337, 339, 341, 343, 349, 377, 407, 409, 411, 413–415 Commonwealth, 24 Charlesgate East (419 Commonwealth), and 447, 449, and 451 Marlborough (composed of 451-457 Marlborough). In May of 1981, the Commonwealth College Trust applied for permission to legalize the occupancy of 329 Commonwealth as five apartments, which it indicated was the existing condition. It subsequently abandoned the application. On June 12, 1981, Glen Grant converted 329 Commonwealth into five condominium units, the 329 Commonwealth Condominium. In February of 1985, the 329 Commonwealth Avenue Trust filed for (and subsequently received) permission to legalize the occupancy as five units. Between September of 2015 and June of 2016, all five units were acquired by the 329 Commonwealth LLC (Ty Gupta, manager of record). On February 24, 2017, it amended the condominium master deed to permit remodeling and reconstruction of the building, including changing of the configuration of the units. The remodeling included addition of an interior garage and a penthouse. On February 24, 2018, 329 Commonwealth LLC filed a new master deed, with five condominium units, the name remaining the 329 Commonwealth Condominium.